Our SportsCluster® system is a versatile solution for venues that are using existing poles, specialty-use poles, or roof-mounted structures. SportsCluster’s stadium and arena lighting—with LED as well as with an HID source—is a durable, dependable system solution that delivers the same unparalleled light control and application for which Musco is known. Designed as a modular system, with electrical components remote from the luminaire assemblies, SportsCluster® System is a streamlined solution that easily adapts to your choice of structures and makes retrofitting a simplified and trouble-free process. SportsCluster® System comes factory assembled, aimed, tested, and ready to deliver guaranteed light levels and precise control at your facility, which will improve energy efficiency and, ultimately, your operating costs. 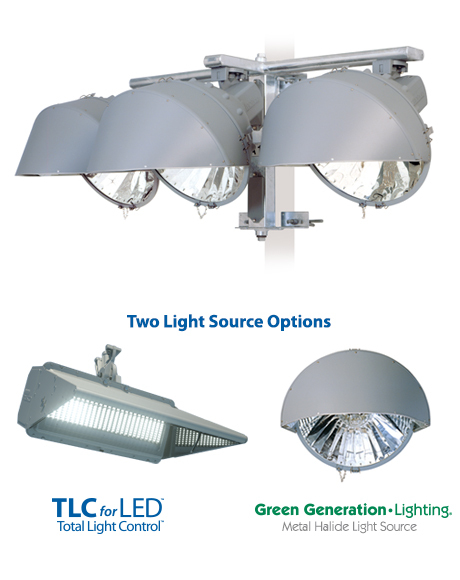 The system will cut energy consumption by as much as 80 percent while virtually eliminating glare and wasteful spill light into the surrounding area. The efficiency of your SportsCluster® System will be further enhanced with Control-Link®, our innovative monitoring service that enables you to efficiently schedule and control your lights from a smart phone, web page, or our 24/7 call center.